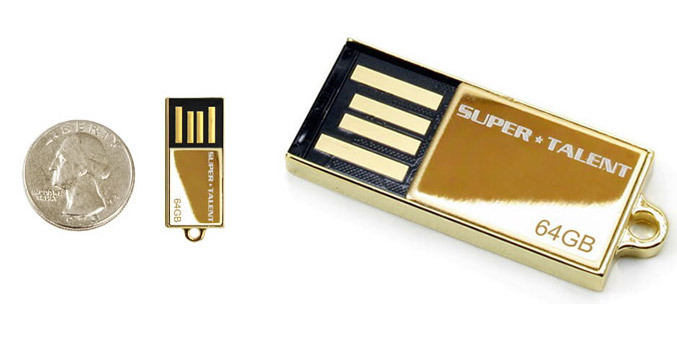 Super Talent Technology launches a special edition of its PICO-C USB flash drive, now with 64GB and with 24k gold plated casing. The drive measures 31.3 x 12.4 x 3.4 mm, weights less than 6g and from Super Talent claims that it is the world’s smallest USB drive with 64GB capacity. The Pico -C feature rugged, water-proof, cap-less design, has a USB 2.0/1.1 interface and offers read speeds of up to 30MB/s and write speeds 15 MB/s. You can pre-order this golden 64GB Pico-C drive for €170.